FBI Director James Comey has admitted that former DOJ Loretta Lynch had vowed to do everything within her power to save Hillary Clinton from jail. 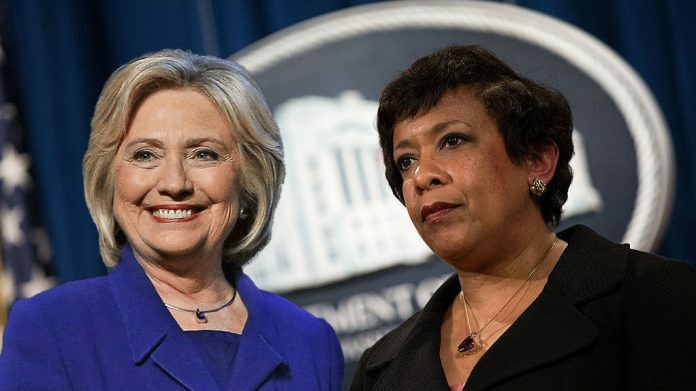 According to Fox News reporter Catherine Herridge, the FBI found an email that indicated the Department of Justice were actively seeking to ensure Hillary remained immune from prosecution – regardless of her guilt. Of course Comey wouldn’t reveal who sent the email and to whom it was sent. But it sounds like it was sent from someone who worked closely with Lynch, and sent to someone who was very worried about Clinton going down in flames, probably someone very close to Clinton. I don’t think he’s just talking about the meeting Lynch had with Bill Clinton. It sounds like she boxed him in – in more ways that just that meeting. If that new email is any indication, she very likely coerced him directly, pushing him to play the ‘no intent’ defense for Clinton and her aides.